The daily Pennsylvanian (New York-Philadelphia-Pittsburgh) covers a 444-mile route that crosses over the Rockville Bridge – the oldest stone masonry arch railroad viaduct in the world – and famed Horseshoe Curve and passes through Pennsylvania Dutch Country and the Appalachian Mountains. As the days grow shorter and the air crisp, the train offers generous views of colorful fall foliage, especially through the mountains of western Pennsylvania. the commonwealth than the Broadway Limited, shown above. The Pennsylvanian preserved service to western Pennsylvania communities not served by the Broadway Limited (Washington/New York-Chicago), which operated over the same route across the southern part of the state. Originally running between Philadelphia and Pittsburgh, the Pennsylvanian was extended to New York City in October 1983. Fifteen years later, following the cessation of state funding and to accommodate growth in Amtrak’s mail and express business, Amtrak extended the train west to Chicago and returned the eastern terminus to Philadelphia. with the result that it served Ohio communities during the day. 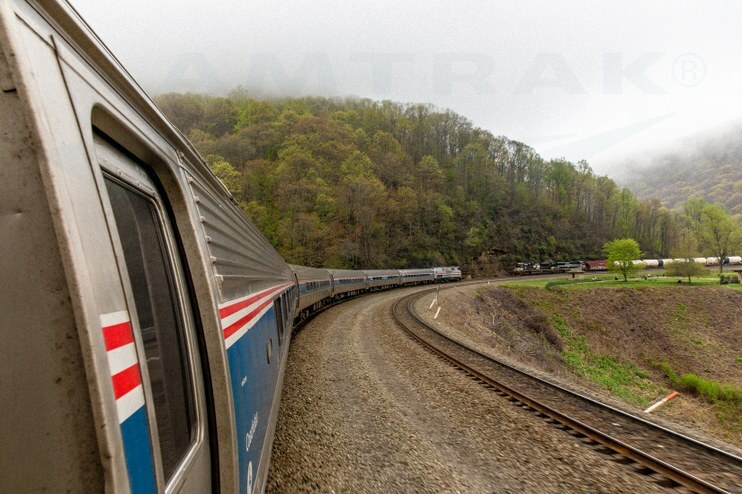 In addition to accommodating mail and express, the expansion and an adjusted schedule offered Ohioans daylight passenger rail service – all other Amtrak trains served Ohio cities early in the morning. 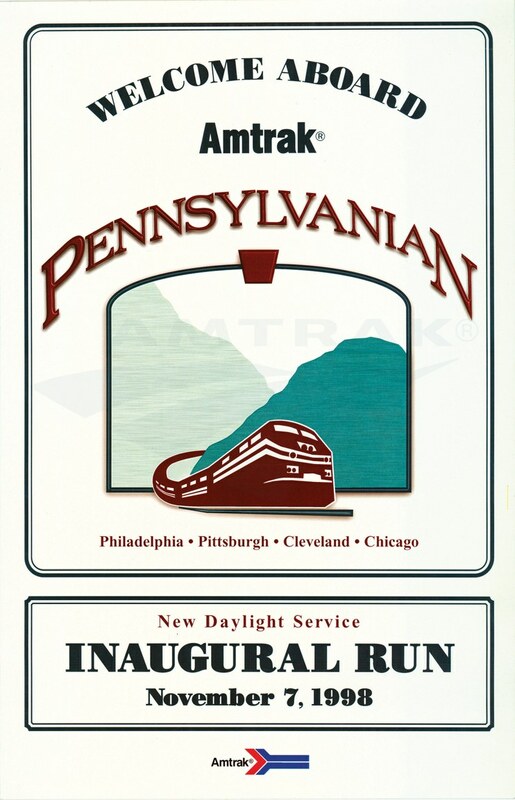 An Amtrak press release issued on November 9, 1998 quoted Amtrak Intercity President Lee Bullock: “The expansion of train service…is in keeping with Amtrak’s recently-approved Strategic Business Plan, to develop a market-based, customer-driven transportation service supported by passenger fares and a growing mail and express business.” Crowds greeted the Pennsylvanian as it made its first stops in South Bend, Ind. ; Toledo, Sandusky, Elyria, Cleveland and Alliance, Ohio; and Pittsburgh. 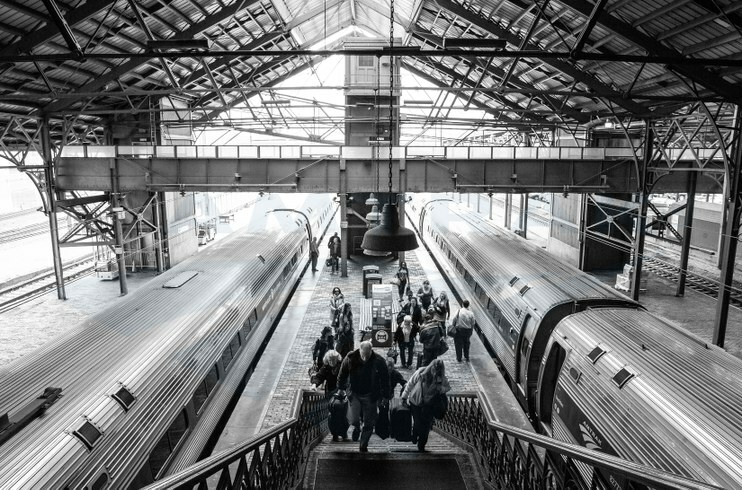 Early morning departures and late night arrivals in Chicago and Philadelphia hampered connections with other trains and adversely impacted ridership. After five years, discontinuance of most express business and low ridership prompted Amtrak to revert the train to its Pittsburgh-Philadelphia-New York routing in February 2003. Today, the Pennsylvanian is again state-supported, financed primarily through funds made available by the Pennsylvania Department of Transportation. In fiscal year (FY) 2015, nearly 232,000 customers rode the train. Between FY 2010 and FY 2015, ridership increased by 14 percent. Norfolk Southern owns the tracks west of Harrisburg, while Amtrak owns the railroad east to Philadelphia, where the train can reach top speeds of 110 mph, and the Northeast Corridor from Philadelphia to New York City where maximum speed is 125 mph. 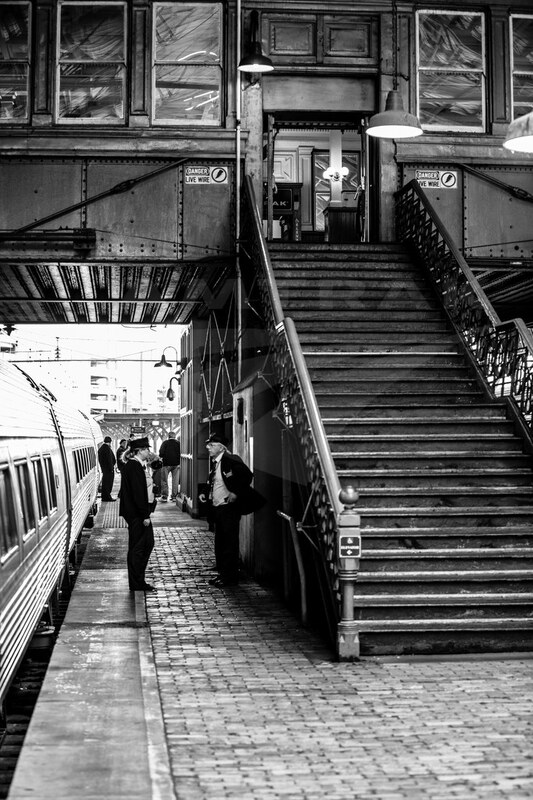 In May 2016, Amtrak Senior Photographer / Senior Videographer Chuck Gomez visually documented a day in the life of the Pennsylvanian. The photos below trace the journey between Pittsburgh and Harrisburg. The Best Job: Locomotive Engineer Jerry Meyer began his railroad career with Conrail in 1978 in the Track department. 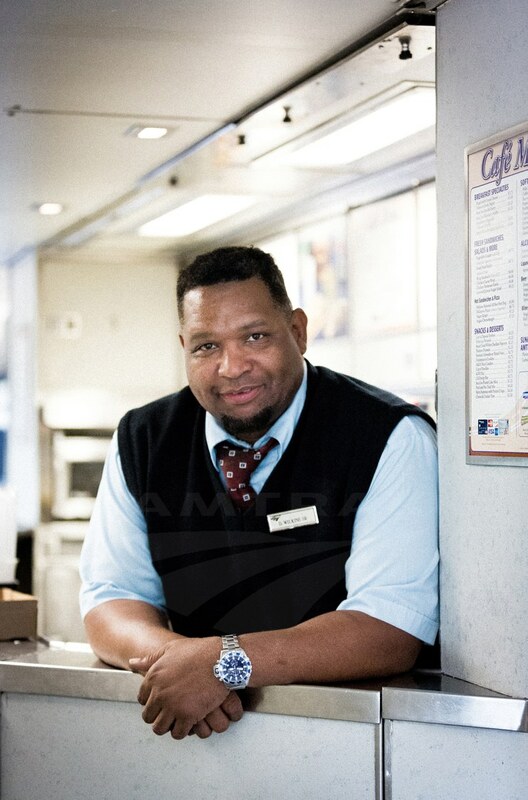 Two years later he joined Amtrak, where he served as a tower operator and a conductor before qualifying as a locomotive engineer in 1997. "[Being an engineer] is the best job on the railroad, and God only knows I've done a lot of them," he says. The engineer is responsible for operating the locomotive or cab control car safely and efficiently and must know intimately the physical characteristics of the territory over which he or she operates, including the track configuration, allowed speeds, signal systems and station locations. Waiting on the Train: P-42 diesel-electric locomotive No. 145 leads the Pennsylvanian as it pulls into Greensburg, the first stop east of Pittsburgh, just after 8 a.m. The depot was built by the Pennsylvania Railroad (PRR) and opened in 1910. Designed in an ornate Jacobean Revival style, the building features a soaring clock tower topped by a copper ogee dome with finial. Today it houses a popular farm-to-table restaurant and other businesses. No. 145 wears the vintage Amtrak Phase III paint scheme used from 1979 until 1993. This locomotive, along with three others, was repainted in an historic paint scheme as part of the Amtrak 40th Anniversary celebration. General Electric built approximately 200 P-42 locomotives for Amtrak, and they entered service between 1996 and 2001. They have 4250 horsepower and can reach a top speed of 110 mph. An Old Friend: The Lewistown depot holds a special distinction as the oldest surviving structure known to have been built by the PRR. Originally constructed in 1849 as a freight handling warehouse, it was converted to passenger use in 1868. A two story tower located at the center of the trackside façade projects onto the platform area and acts as a visual exclamation point. In 1985, the Pennsylvania Railroad Technical and Historical Society purchased the depot and renovated it for use as a research center. As seen in this image, the Pennsylvanian uses tubular Amfleet I cars, which began entering service in 1975. The conductor is responsible for the safe movement and operation of the train, the collection and protection of ticket revenue, the conduct of the operating and on-board service crews, the boarding and detraining of passengers and the assignment of accommodations. 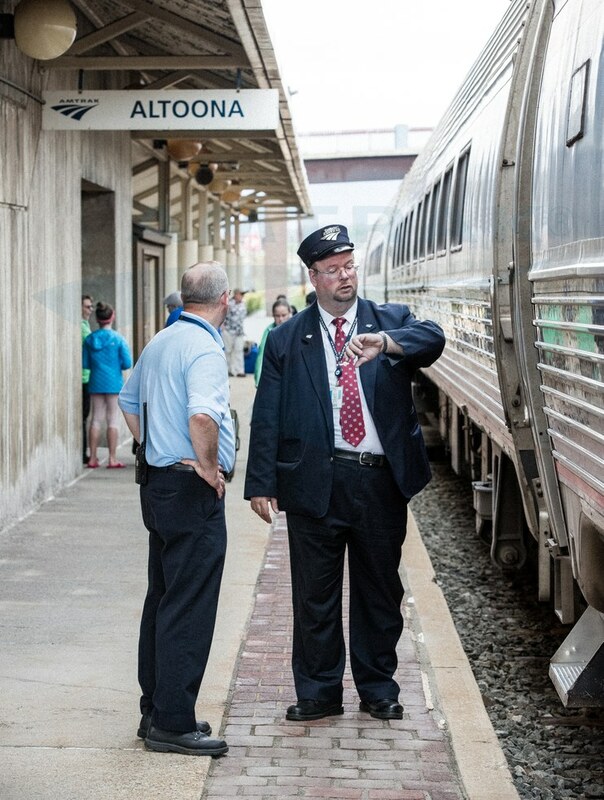 Keeping Time: Secor checks his watch as the train gets ready to depart from Altoona. The Altoona Transportation Center is located in the middle of town and near the popular Railroaders Memorial Museum, which explores the contributions of railroaders and their families to American life and industry. In 1849, the PRR established Altoona as a base for its rail operations over the Alleghenies. By the end of the 19th century, the rail yard and shop complex constituted one of the largest railroad repair and construction facilities in the world, and widely admired for its efficiency and scale of production. 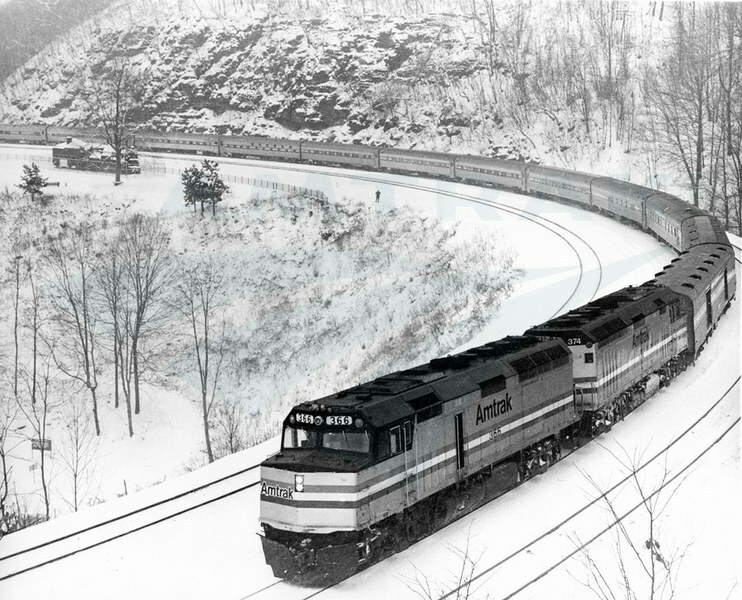 Rounding Horseshoe Curve: Located a few miles southwest of Altoona, Horseshoe Curve was completed by the PRR in 1854. Construction of the 2,375-foot long curve necessitated the blasting of a hillside and filling of two ravines. Considered a 19th century engineering marvel, Horseshoe Curve is designated a National Historic Landmark; you can observe railroad operations from a viewing platform near the center of the curve. Just to the west along the railroad in Gallitzin is the Allegheny Tunnel, constructed by the railroad through the Allegheny Mountains. When finished in 1854, it was the longest railroad tunnel in the United States at 3,612 feet and allowed trains to pass between Philadelphia and Pittsburgh without the need for inclined planes. From 1902-04, the neighboring Gallitzin Tunnel was excavated to the north. 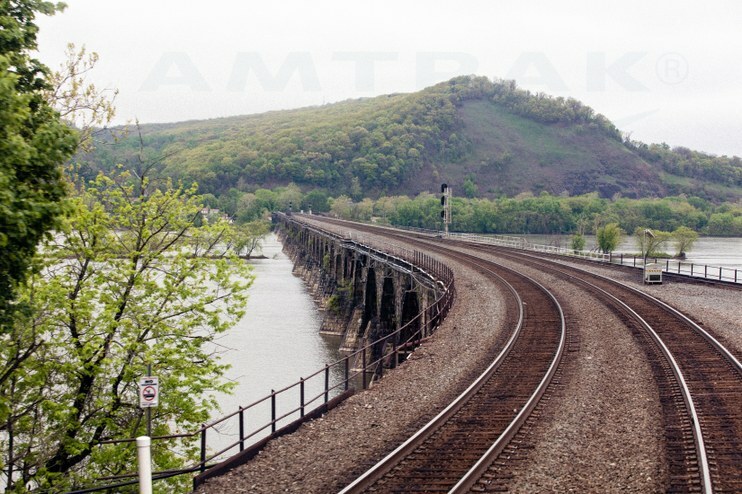 Crossing the Rockville Bridge: According to the Historic American Engineering Record, the PRR completed its first bridge over the Susquehanna River approximately six miles north of Harrisburg in 1849. It was subsequently replaced in 1877, and in 1902 with the present stone arch structure. At the turn of the 20th century, the PRR had embarked on an extensive program to improve its infrastructure, including realigning tracks to eliminate curves, constructing new stations and building masonry bridges. Although it appears to be built of solid stone, the Rockville Bridge actually has a concrete core with a sandstone exterior. More than a century after it opened to rail traffic, the bridge remains the world's longest of its type, at 3,791 feet with 48 arches. It was added to the National Register of Historic Places in August 1975. Switching Power: Although today’s Pennsylvanian changes from diesel to electric power when it reverses direction in Philadelphia, Harrisburg is an important transition point between diesel operations to the west and electric train operations to the east. The PRR completed the Queen Anne-style station in 1887. Its distinctive gambrel roof was reconstructed in 1905 after a serious fire the previous year. Now known as the Harrisburg Transportation Center, the complex includes the two historic steel and timber train sheds, shown here, that employ Fink roof trusses. The facility is listed on the National Register of Historic Places and is designated a National Engineering Landmark. The domed state capitol is just a short walk from the station. 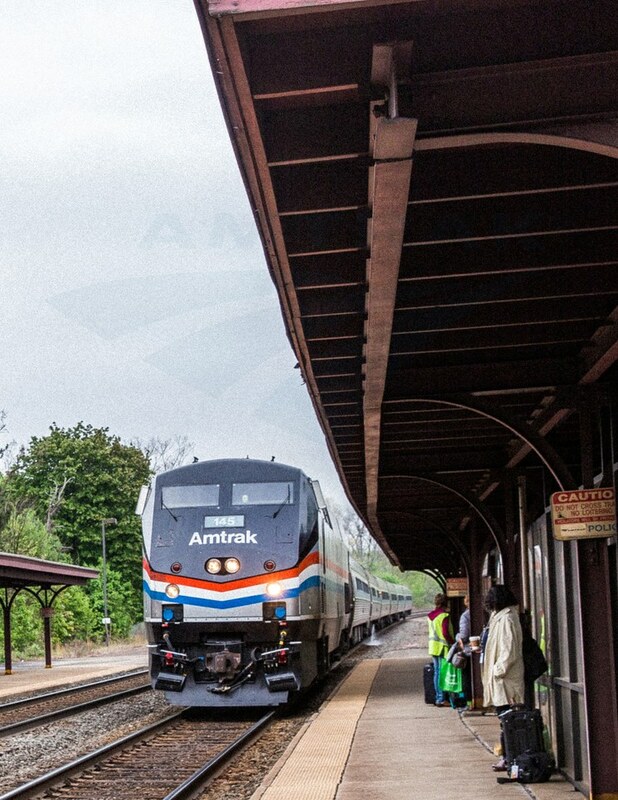 Platform Banter: In addition to being a stop for the Pennsylvanian, Harrisburg is also the western terminus for more than two dozen state-supported Keystone Service trains connecting the city with Philadelphia, New York and communities in between. In FY 2015, the service carried more than 1.36 million customers. Between 2004 and 2006, the Commonwealth of Pennsylvania and Amtrak undertook the “Keystone Corridor Improvement Project” with the goal of improving the 104-mile rail line between Harrisburg and Philadelphia. The completed work allowed for all-electric train service, top speeds of 110 mph and additional train frequencies. 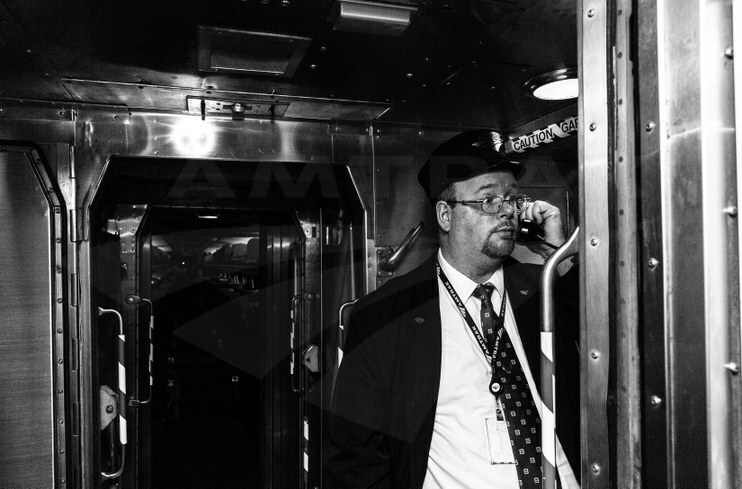 Minding the Station: Amtrak Ticket Agent Scott Miner started with the company in 1999. He assists many of the more than 500,000 rail customers who pass through the Harrisburg Transportation Center every year. 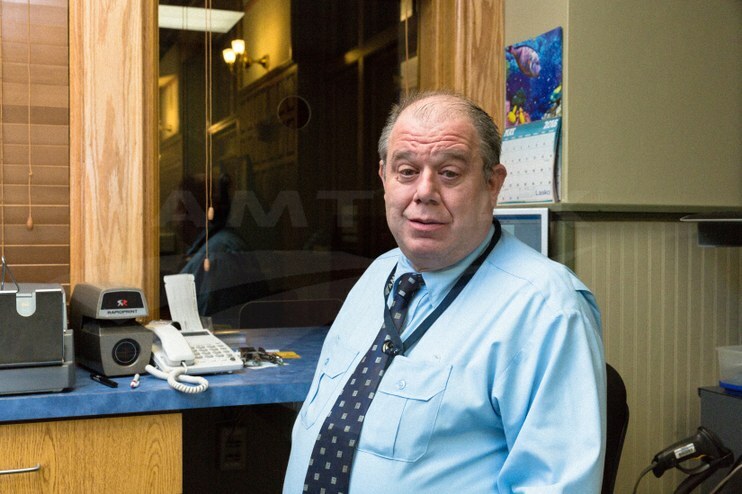 Ticket agents like Miner provide passengers with superior customer service from behind the ticket counter or on the station floor or platform. They are skilled in the processing of all types of Amtrak tickets and possess a thorough understanding of fares. Ticket agents verify that passengers are properly ticketed or have the proper travel documents, ensure compliance with baggage requirements and assist with luggage and the boarding of trains. 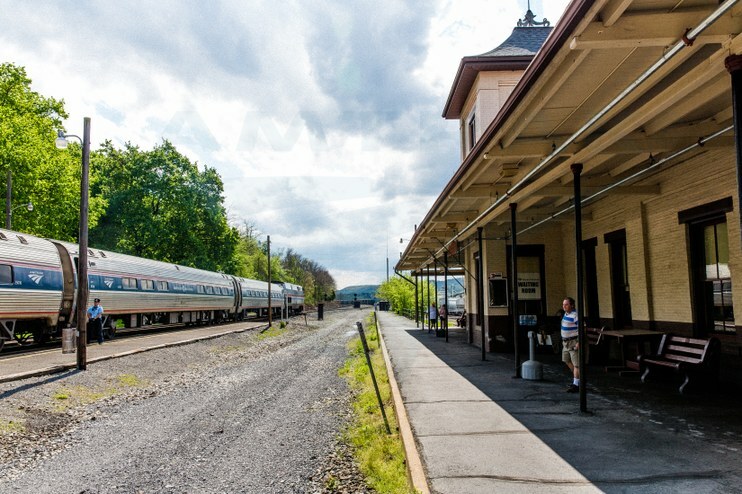 Do you have any favorite memories of riding the Pennsylvanian? Share them with us in the comments section!